This has been quite a year for Wisconsin hoops fans, with the Badgers earning their second Final Four berth in as many years. But what are we to do in the very near future when March Madness suddenly gives way to April Withdrawal? For the suffering basketball lover, laughter – with a side of phenomenal slam-dunking and ball-handling prowess – is just what the doctor ordered. Filling that prescription is as easy as getting a ticket to see the legendary barnstorming Harlem Globetrotters who will play Tuesday, April 7, at North High School in Eau Claire. 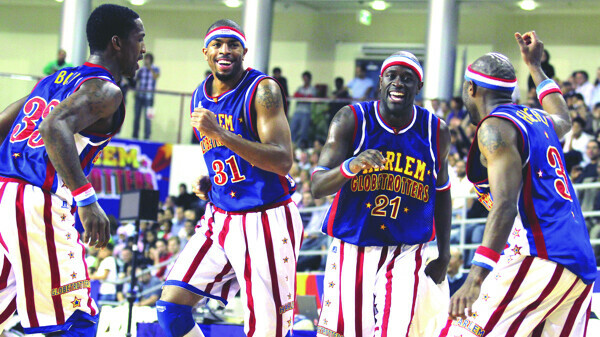 They may not really be from Harlem (fun facts: the Globetrotters were founded in Chicago and are now headquartered in Phoenix), but for nearly 90 years the team literally has trotted the globe, playing more than 20,000 games (most of them against the hapless Washington Generals) in over 120 countries. The Globetrotters are perhaps best known for clowning around with fans, making trick shots, and defeating a team of robots on Gilligan’s Island (seriously, that happened in a TV movie). However, they are more than showmen (and, these days, showwomen): They’re legit competitors, too. A decade ago they beat some of the best college teams in the country (including the then-defending national champions, Syracuse) before the NCAA put the kibosh on such exhibition games. Over the years, the Globetrotters’ roster has included basketball legends such as Wilt “The Stilt” Chamberlain, Meadowlark Lemon, and – briefly – Magic Johnson. Today’s team is made up of players with equally great nicknames – including stars Herbert “Flight Time” Lang and Nathaniel “Big Easy” Lofton – all of whom carry on the fabled tradition of jocular athleticism. Whether you’re looking for some good laughs, some jaw-dropping thrills, or (ideally) both, a ticket to the Globetrotters shouldn’t disappoint.